Egyptian soldiers and police personnel have killed 105 terrorists since the start of Sinai anti-terrorism operation in February. 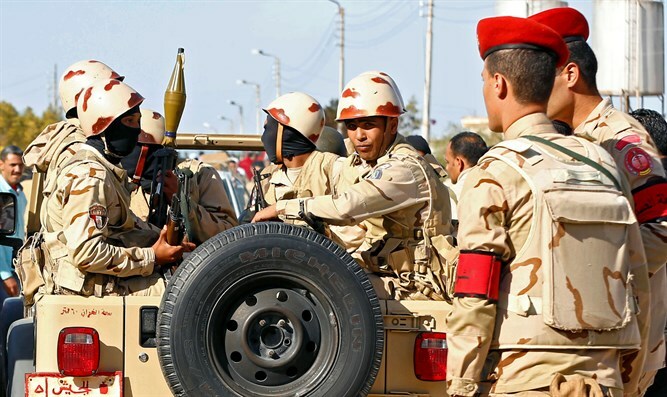 Egyptian soldiers and police personnel operating in the Sinai Peninsula have killed 105 terrorists since the start of an operation in February, a spokesman for the Egyptian army said Thursday, according to the Al-Ahram newspaper. The spokesman, Tamer Al-Rifai, said that the forces are performing their duties “with high morale”, adding that there is no time limit on the operation and it will conclude when it achieves its goals. Operation Sinai 2018 was launched on February 9 in the Sinai Peninsula, where Egypt has been fighting an Islamic State (ISIS) insurgency for several years. Most of the attacks in the Sinai Peninsula in recent years have been claimed by the Sinai Province, Egypt's ISIS affiliate. Egypt has been under a state of emergency since April last year, after two suicide bombings at churches claimed by ISIS killed at least 45 people in the cities of Tanta and Alexandria. Rifai had said when the operation started that its goal was to tighten control of border districts and "clean up areas where there are terrorist hotbeds". On Thursday, he said that 16 army personnel have been killed and 19 others have been injured during Operation Sinai 2018. The army has also located and destroyed five tunnels, two communication and broadcast centers, 41 4x4 vehicles, 387 motorbikes, 471 IEDs, in addition to large amounts of TNT and plastic explosives, added Rifai. The army has also destroyed 1,907 targets used as shelter by terrorists, as well as storehouses containing medical equipment, weapons, ammunition, mines and materials used in manufacturing improvised explosive devices. Operation Sinai 2018 involves land, naval and air forces, as well as police and border guards. He also stressed Egypt’s respect for the sovereignty of all countries sharing its geographical borders, and that Egypt is fully coordinating with its neighbors to secure the borders and exchange information on the presence and movement of terrorist elements. The New York Times reported recently that Israel has launched air strikes against ISIS targets in northern Sinai with Egyptian approval. The report, which cited U.S. and British sources, claimed Israeli aircraft attacked targets in Egypt's Sinai Peninsula over 100 times in the past two years. Rifai later vehemently denied the report, insisting it was not “credible” and adding that the Egyptian army is the sole entity that is conducting military operations in co-operation with local police forces in certain areas in North Sinai.